24 Hour Locksmith Services in Los Angeles. 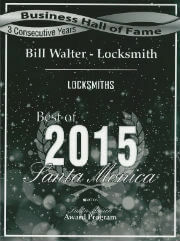 Bill Walter serves LA's Westside, Pacific Palisades, Santa Monica, West LA , Venice, Marina del Rey. Open locks, Re-key Locks, Replace Locks, Duplicate Keys, Master Keys.